Riding The Ronquières Inclined Plane. 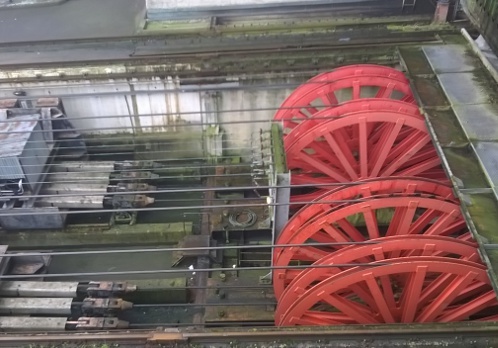 One of the world’s largest canal-boat lifts – by bike – from the inside! Wednesday’s bike ride was enjoyable enough because of the cycling. 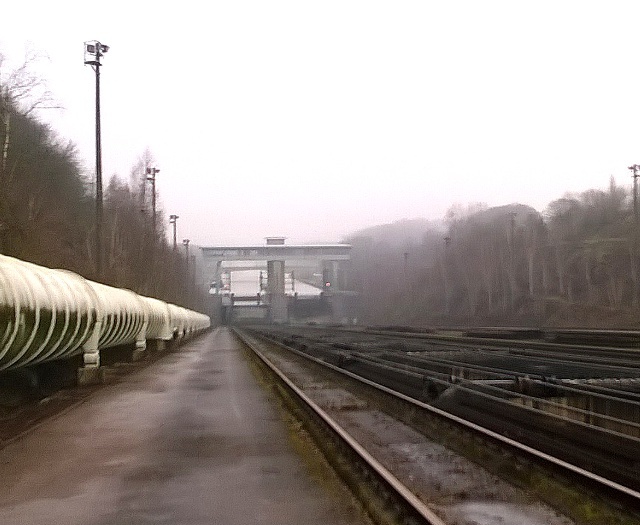 But there was one other feature that made the day memorable, not least because it came upon me completely by surprise and gave me unprecedented access to a Belgian transport landmark. I was cycling along the Charleroi-Brussels Canal that makes up Ravel 1, one of the longest off-road cycle routes in Belgium. It was deserted and a thick mist had come down so there was a sense of riding along a narrow closed corridor. 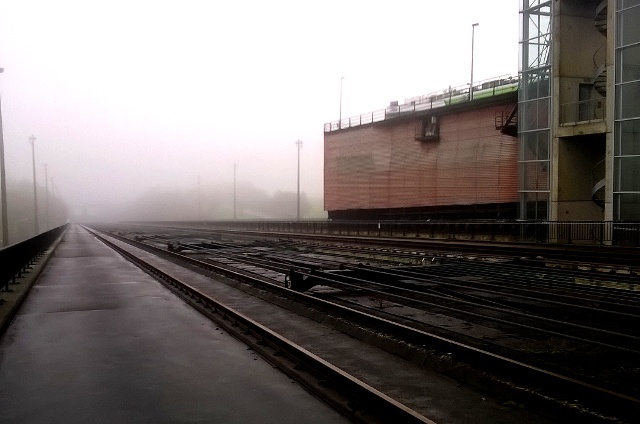 I got my first surprise when I realised I had started cycling out onto a huge viaduct with the ground disappearing away to the mist on my side. As someone who sometimes suffers from vertigo this was more than a little un-nerving but the infrastructure was big and wide so I was quite relaxed. 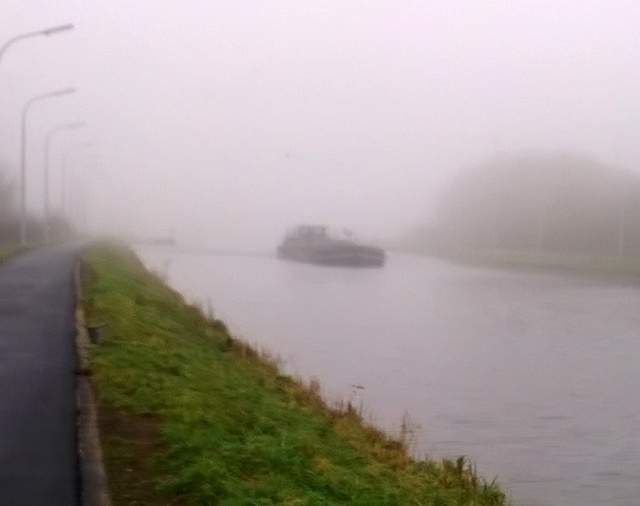 Then out of the mist came the shape of a lock gate so I cycled up to the edge for a look, but the view made me stop in amazement. There was no lock gate. In fact there was not even a canal. Below me there was a something resembling a huge railway yard sloping into the distance, with not a drop of water in sight. Then I realised that projecting down the hill was a boat sitting in a massive tank of water. The tank was on wheels and it was waiting to descend the slope. 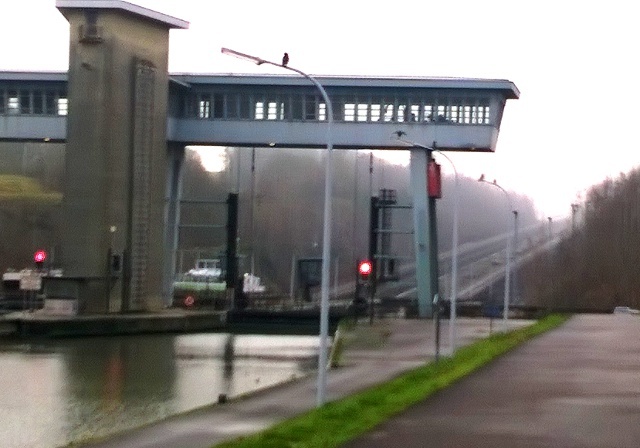 I had stumbled onto The Ronquières Inclined Plane, a boat lift that can carry up to 5600 tonnes of water and boats between the two levels of the canal almost 70 metres apart in height. It is a notable local landmark and visitor attraction but I hadn’t paid enough attention to the maps to realise that it was on this section. 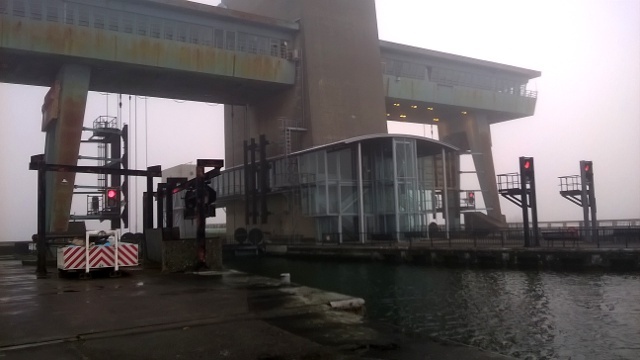 Taking 8 years to build in 1968 it replaced 18 lock gates and is still the largest boat lift of its kind in the world. After a few minutes taking in the view of the long slope disappearing in to the mist I rolled my bike down only obvious route out, a steep ramp down the side of the structure. To my amazement I popped out almost under the giant tin bath carrying the boat, right beside the huge cables that pulled and lowered them down the ramp. It was canal infrastructure on an enormous scale, made all the more impressive by realising the weight of water that was above me. I was having a close encounter with one impressive piece of engineering. I was a little surprised to discover the cycle route ran right down by the works but I enjoyed the descent, it was amazing. I now know that it is over 1400 metres long, which is why I could hardly see the end in the mist. However there was a shock at the bottom when I found it came to a complete dead end against a huge wall and some locked gates. Ooops, I had the dawning feeling I was not meant to be there and I had come into a part of the works that was really not for visitors. And now I had to climb back up the 1400 metres of steep incline, although it did give me a spectacular and imposing sight view of 5000 tonnes of boat and water creeping down from above me. I puffed my way almost back to the top when I noticed a side gate where I was pleased to throw my bike over the top and get out on to a service road and back to ground level. From there I was able to ride round the sides of the embankment and reappear at the bottom and look back up to the top shrouded in mist once again, only this time from the right side of the fences. And in all that time I never saw a human being and I was never challenged by a security guard or anything. A remarkably laid arrangement that gave me a privileged access. 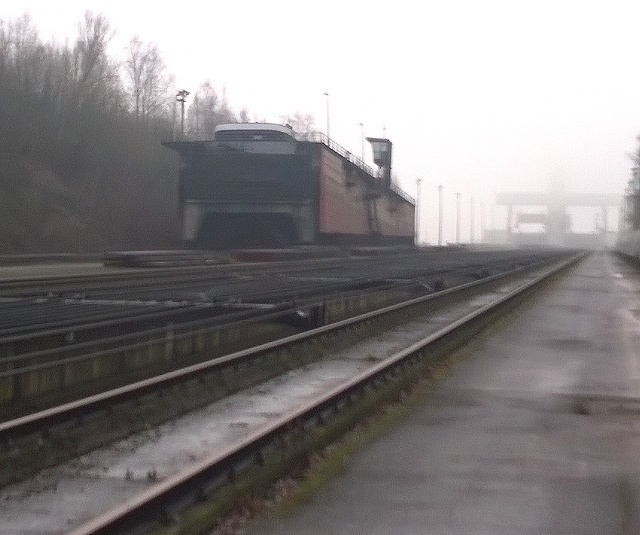 In the summer it is possible to ride a cruise boat up and down the lifts and to go into a panoramic tower that looks down over the spectacular works and the surrounding countryside but I rather enjoyed the way this monster came to me out of the winter mist. 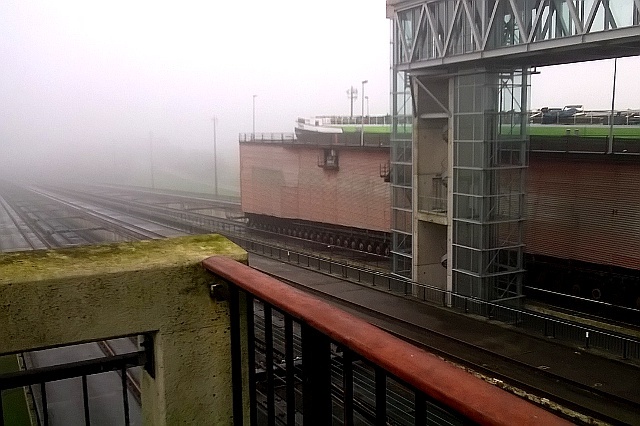 I may not have had a railway set as a child, but I am a bit of a sucker for spectacular engineering and by chance I had a very special view of Le plan incliné de Ronquières. Now I know it is there I may well go back, but I very much doubt I will get anywhere near the workings. As well as my dull and misty photos the incline has its own supporters association with some spectacular photos and a fuller history, I shall read up on it properly before I go next time! This entry was posted in Life in Belgium, Travel and tagged Belgium, boats, Canals, cycling, Ravel, Tourism, Visting, Wallonia by kevinmayne. Bookmark the permalink. It’s a crazily magnificent piece of engineering isn’t it Kevin! And as you say, it just appears from nowhere. Another impressive and monumental, although more modern, edifice is the Strepy-Thiey lift, which you would also be able to cycle too. The ideas for great places to ride just keep building up! I need for weekends or more holidays.